A McDonald's staff member has tipped water over a sleeping homeless woman. Georgia Kenney was outside a branch in Leicester and said she woke up feeling wet at about 07:00 GMT. When she fully came to she said she saw a big bucket of water coming towards her. The 19-year-old said no attempt was made to warn her before she was soaked and she planned to involve the police. 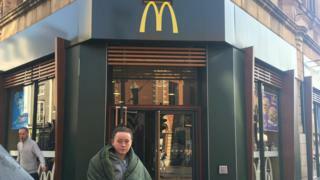 McDonald's disputed she was given no prior warning but has apologised, adding "more consideration" was needed. Miss Kenney, originally from Barwell in Leicestershire, has been sleeping rough in the city for a year since she and her partner broke up. She said: "I was woken up feeling really wet and I was just like, 'What is that?' and I got up and saw water coming all the way down. "I got up and the manager came out with a big bucket of water and poured it all down where I was lying. "I said he could have woken me up before he did it, he said he tried." Miss Kenney said an eyewitness confronted the member of staff at the Market Street restaurant, because no prior attempt was made to wake her. The restaurant disputed this and said it did issue a prior warning. Miss Kenney said she was only relieved it had not happened any earlier in the morning, when temperatures were even colder. "It could have been a worse situation. "I could have been in hospital. "Even staff at the store said it was disgusting and that I need to report it," she said. A spokeswoman for McDonald's said: "We apologise for this incident. Leicestershire Police said it was investigating.